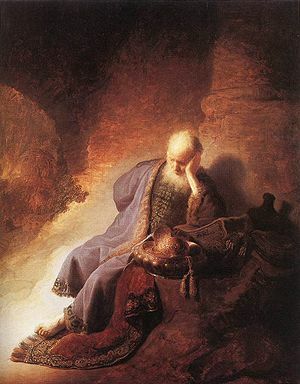 I’ve been reading lately in my devotions about the Prophet Jeremiah. He came to so many hard places in his life, suffering greatly for the message that he preached. In fact, he not only suffered physical harm because of it, but he preached and prophesied for years and years without any fruit to speak of. Jeremiah thought he couldn’t do it either. During one of the times he was jailed, he made a decision to not serve God anymore. It had caused him too much pain, too much ridicule, too much hardship. So, instead of proclaiming the word of God, he’d just keep silent. Maybe it would save him from the hard life and persecution that he had suffered for so long. How amazing is that! The word of God was like a burning fire shut up in his bones. He couldn’t keep silent. He HAD to preach. He HAD to serve Jehova. Have you ever felt like this? Have you ever known something so juicy that you couldn’t wait to just tell somebody? A funny story, an interesting piece of information, a rumor or a gossip or a truth. We are like this with worldly and carnal things, but when was the last time that you burned inside because you just had tell somebody about Jesus? Challenging thought. It got me. Posted on September 30, 2010, in Personal Study, Random Thoughts and tagged Jeremiah, persecution, Preaching, Religion and Spirituality. Bookmark the permalink. 1 Comment.